This strike, which prompted Andy Gray to first say “take a bow son!”, is Rooney’s greatest goal. Improbably, Wazza was arguing with the ref almost up to the exact moment when he struck a volley of devastating, Shay Given-beating power. He was also about to be substituted, having picked up a knock in the first half of the game. I don’t know if I would go so far as to call it Rooney’s greatest goal. Surely his first goal against Arsenal at the age of 16 was better, no? I will say though, that as a Gooner, this is by far my favorite. It encompasses everything we love and hate about Rooney: his unimpeachable talent, his incorrigable temper, and his ability to make something out of nothing from virtually anywhere on the pitch. 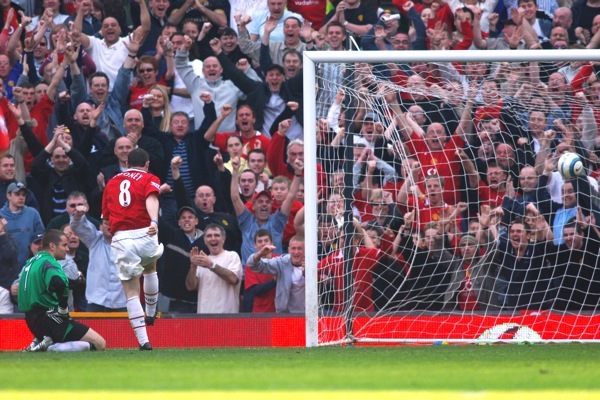 I love this goal – I remember seeing it in a pub in Liverpool with my friends, we weren’t watching the match that intently and for whatever reason the conversation dried up and we all let our eyes drift to the screen about three seconds before Rooney hit that volley. Perfect moment.